“Again, I’m sorry.” Elric said, for a moment he wondered what would happen to him if the same would have occurred. He at least knew it was only his own fault. Silence held both men as they were lost in thought. Eft was considering Elric’s goal and plans, and Elric was pondering if he would have done the same thing as Eft. This time Eft broke the silence. “From what you’ve told me about this group, they deserve so much more.” Elric said and Eft nodded in reply. They stood there grinning at each other like idiots for another minute before Eft dug through another drawer to find a folder. From inside he pulled out a piece of paper. The top of it said, Short Term Leave and FMLA Policy. The top part of the form was already filled out with Elric’s information. Elric nodded, stood up, and left the office. His first destination was to Henchman resources to find out about pay. Sandra sat at a desk and her smile almost made Elric want to turn around and go the other way. Her innate succubus abilities made her irresistible. Taking a mental image of the room, Elric closed his eyes, and stepped to the desk. “I wanted to inquire about pay, I know I’m being compensated in other ways, but it was alluded to that there was still a stipend.” Elric said. “All of it.” Elric said, struggling to keep his eyes closed. He breathed through his mouth to reduce any scent based attacks, and wondered if there was a better way. The sounds of paper being rifled was interrupted by an occasional, mmmMM, or hmmm. “I see here you have a sizable endowment,” Sandra’s voice appeared right by Elric’s ear. He could feel her hot breath caress the hairs on his neck. “I’d service it, but its too big for me. I’ll send you to payroll.” Some folded papers were placed in Elric’s right hand. “Th, spank, er. Thank you.” Elric said taking a step backwards and then immediately turning and running out of the room. He opened his eyes to make sure he didn’t hit anything. Behind him a sweet sultry laughter followed. When he was far enough away from the worst person to have in a HR department, Elric took a look at the paper. 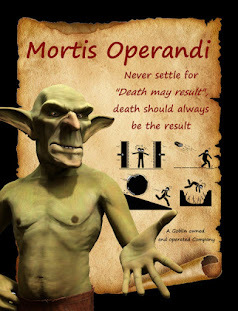 The weeks he had been at Mortis Operandi were all noted and next to each week was a noted 10 gold. At the bottom another note, “Employee Bonus” was listed and it had 2,000 gold noted next to it. After a quick stop to Payroll and a 2,000 gold withdrawal, Elric went to find Guldag. He was able to locate the goblin in the recreation room. A couple of Goblins were playing a game where they kick a melon sized ball of fur back and forth. Neither of the goblins looked like Guldag, but he had only met the guy a couple of times. Both Goblins pointed towards the ball of fur, which Elric responded with a look of confusion. One of the goblins reached over to a table to grab a glass filled with a liquid and then poured it over the ball of fur. The ball grew a little and the fur sloughed off. Soon a naked goblin stood there looking at the goblin who poured the liquid on him. Elric recognized the third goblin. “I didn’t give up, you are still buying this round.” Guldag said. The accused goblin set the mug down and simply pointed at Elric. Guldag turned around and glared at Elric. “I’m sure theres a fucked up reason, normally I would love to know, but time is limited.” Elric quickly said. He emphasized the issue by jingling a bag of gold coins. “You never played Dung dug?”Guldag said. “Nope, maybe another time. Of which time. Can I buy some transportation.” Elric said. “He owes us a round.” The goblin who had been quiet this whole time said. His hand pointed at Guldag. The other goblin nodded in agreement, but Guldag was silent. “Here,” Elric said as he slapped a small handful of coins on the table. One platinum, three gold. The three goblins nodded in agreement. “Let us drink to our new found friend.” Guldag said. “No, not enough time.” Elric quickly said. “It will be.” Elric said, then he guided the Guldag towards the teleportation room. Along the way he reviewed with the goblin his plan to visit each Woodale the goblin knew, and as many other towns or cities he also know. The goblin settled on a price of 400 gold for two days of transportation to 15 locations. Guldag also negotiated a price of 500 gold to keep silent, and to hide the sudden windfall from his friends.